Watch a full replay of the Air France Paddle Festival webcast. 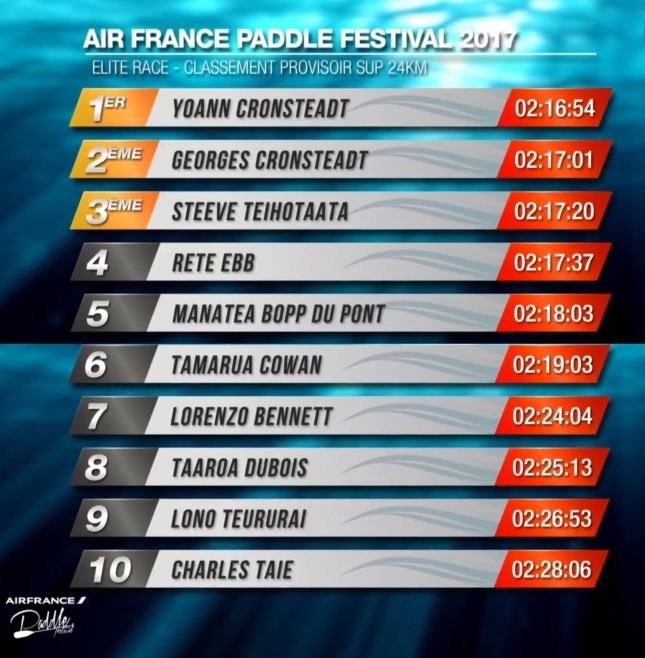 Yoann Cronsteadt has upset the titans of Tahitian stand up paddling to claim the 2017 Air France Paddle Festival ahead of his well-known brother Georges and fellow internationals Steeve Teihotaata and Rete Ebb, while Sonni Honscheid has saluted in the women’s race. The international race season continues this weekend with Tahiti’s biggest event, the Air France Paddle Festival, which will see over 300 paddlers hit the crystal clear blue waters of French Polynesia for a big day of racing. And the whole thing will be webcast live right here. The 2017 Air France Paddle Festival is going to be a very interesting showdown. While there aren’t too many internationals on the line, virtually every one of Tahiti’s top paddlers will be taking part, and if you know anything about Tahitian paddling you’ll know that means an extremely competitive field. While those who follow the outrigger canoe racing world have long known that Tahiti is an absolute paddling mecca (the nation is virtually unbeatable in outrigger races), it’s only in the past two or three years that their SUP racing credentials have been brought to the fore. After Georges Cronsteadt carried the torch on his own for many years, the Raging Bull from Tahiti has been joined by several new outrigger-turned-SUP-racing stars in recent times. That includes the likes of Steeve Teihotaata, Rete Ebb, Niuhiti Buillard and several others that have the potential to not only dominate this race but virtually any other race in the world. And for that reason I’m very curious to see the results on Saturday; the Air France Paddle Festival is the de facto “national titles” of French Polynesia. If you’re as interested as I am, then you can watch the whole race LIVE via the Air France Paddle Festival official webcast from 11:15am Saturday local time (what’s the time in Tahiti?). The whole thing is probably going to be in French, but it’s also going to be produced by the national TV station, so expect some great footage as the 300+ competitors paddle through Tahiti’s iconic lagoon. You can follow the countdown to the race on the youtube embed up top, and if you miss the action don’t worry – we’ll have full results direct from Tahiti on Saturday afternoon. The 2017 Air France Paddle Festival is also a 2-star event for ‘Season 2017’, so expect some updates to the World Rankings come Monday morning.